The concept of standup meetings, for quick updates and daily commitments, was introduced by Extreme programming and scrum teams. It is a great innovation that created a forum to bring out impediments in a project and re-commit on a daily basis. There is an emphasis to keep these meetings short (standing up definitely helps in adhering to the time). Any team that successfully transitioned to scrum will vouch for the effectiveness of the standup meetings. However, there are many teams who are finding it difficult to extract the full benefits of standup meetings. Some teams find it difficult to adopt standup meetings successfully due to lack of clarity on what should happen in standup meetings and who should attend it. Is Standup Meeting a Status Meeting? Purists (of Scrum) say it is not a status meeting. Others counter ‘how can it not be a status meeting when you ask what was done since the last meeting?’ Purists retort ‘but this is between peers and managers are not supposed to be part of these meetings’. One must agree, traditionally status always moved upwards in the organizational chain and this idea of status being broadcast to everyone in the team is a great innovation. There is a need for all to know the context of their work: who is doing what, how it impacts their work, how their work impacts others in the team. However, one needs to appreciate that scrum teams are often working within an enterprise that has its own organizational culture and process where “managers” and “regular updates on status” play an important role. Often this leads to either managers attending stand-ups or a separate process through which managers get their status. A low overhead tool that systematically organizes status, for everyone to see, can greatly alleviate the issue here. With the status being out there for all to view standup meetings can now really focus on issues and impediments. There are few other issues one needs to look into for success of standup meetings. Agile prescribes a co-located team and emphasis on verbal communication. In today’s era of globalization often teams are not co-located. Standup meetings over a conference call are not uncommon. Often this is between team members from different cultures and native languages. In such scenarios having some the status and updates displayed in front of you, when discussing the issues and impediments, can be a big help. Are things falling through the crack? 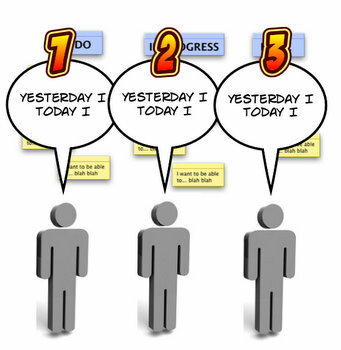 Task and issue centric: each task and issue is picked up in turn and all people related to it might speak on it. In either case it is important to make sure that all issues and tasks are discussed and all important updates and impediments are recorded and followed through. See the video below on how Wizergos Automation helps make scrum meetings more effective and productive. The video below shows how you can run effective daily scrums using the Wizergos Mobile App. At Wizergos we have designed a special Standup Meeting tool. If you see some of these problems in your team, try it out and provide your feedback.